Set deep in the Cavan countryside on 100 acres of beautifully manicured gardens and parkland is the magnificent 19th century Cabra Castle Hotel. The hotel offers a range of luxury accommodations, from authentic, medieval-style Castle rooms, complete with four-poster beds, to the artisan-style accommodations of the Courtyard, featuring old stone walls and delightful views of the walled garden. 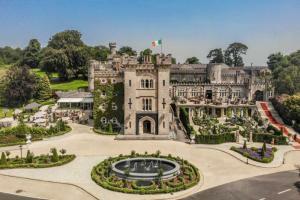 Situated in the east of County Cavan in the north east of Ireland, located outside the town of Kingscourt. Just 54 miles from the Dublin International Airport.